This article is about a type of blood cell. For the endocrine cell of the anterior pituitary, see basophil cell. Basophils are a type of white blood cell. Basophils are the least common of the granulocytes, representing about 0.5 to 1% of circulating white blood cells. However, they are the largest type of granulocyte. They are responsible for inflammatory reactions during immune response, as well as in the formation of acute and chronic allergic diseases, including anaphylaxis, asthma, atopic dermatitis and hay fever. They produce histamine and serotonin that induce inflammation, and heparin that prevents blood clotting, although there are less than that found in mast cell granules. It used to be thought that basophils that have migrated from blood into their resident tissues (connective tissue) are known as mast cells, but this is no longer thought to be the case. Basophils were discovered in 1879 by German physician Paul Ehrlich, who one year earlier had found a cell type present in tissues that he termed mastzellen (now mast cells). Ehrlich received the 1908 Nobel Prize in Physiology or Medicine for his discoveries. The name comes from the fact that these leukocytes are basophilic, i.e., they are susceptible to staining by basic dyes, as shown in the picture. Reference ranges for blood tests of white blood cells, comparing basophil amount (shown in violet) with other cells. Basophil function is inhibited by CD200. Herpesvirus-6, herpesvirus-7, and herpesvirus-8 produce a CD200 homolog which also inhibits basophil function. This suggests that basophils may play a role in the immune response to these viruses. Basophils of mice and humans have consistent immunophenotypes, including FcεRI+, CD123, CD49b(DX-5)+, CD69+, Thy-1.2+, 2B4+, CD11bdull, CD117(c-kit)−, CD24−, CD19−, CD80−, CD14−, CD23−, Ly49c−, CD122−, CD11c−, Gr-1−, NK1.1−, B220−, CD3−, γδTCR−, αβTCR−, α4 and β4-integrin negative. Recently, Heneberg proposed that basophils may be defined as the cellular population positive for CD13, CD44, CD54, CD63, CD69, CD107a, CD123, CD164, CD193/ CCR3, CD203c, TLR-4, and FcεRI. When activated, some additional surface markers are known to be upregulated (CD13, CD107a, CD164), or surface-exposed (CD63, and the ectoenzyme CD203c). 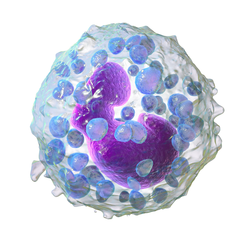 The word basophil uses combining forms of baso- + -phil, yielding "base-loving". ^ "Basophil". Merriam-Webster Dictionary. Retrieved 2016-01-21. ^ "basophil". Oxford Dictionaries. Oxford University Press. Retrieved 2016-01-21. ^ "Blood differential test". Medline Plus. U.S. National Library of Medicine. Archived from the original on 21 April 2016. Retrieved 22 April 2016. ^ Mukai, K; Galli, SJ (2013). Basophils. eLS. Online. doi:10.1002/9780470015902.a0001120.pub3. ISBN 978-0470016176. Archived from the original on 2016-05-01. ^ Khurana (2009). Textbook Of Medical Physiology (2nd ed.). Elsevier. p. 180. ISBN 978-81-8147-850-4. Archived from the original on 2018-05-04. ^ Stone, Kelly D.; Prussin, Calman; Metcalfe, Dean D. (Feb 2010). "IgE, Mast Cells, Basophils, and Eosinophils". The Journal of Allergy and Clinical Immunology. 125 (2): S73–S80. doi:10.1016/j.jaci.2009.11.017. PMC 2847274. PMID 20176269. ^ Franco CB, Chen CC, Drukker M, Weissman IL, Galli SJ (2010). "Distinguishing mast cell and granulocyte differentiation at the single-cell level". Cell Stem Cell. 6 (4): 361–8. doi:10.1016/j.stem.2010.02.013. PMC 2852254. PMID 20362540. ^ Blank, U.; Falcone, F. H.; Nilsson, G. (2013). "The history of mast cell and basophil research – some lessons learnt from the last century". Allergy. 68 (9): 1093–1101. doi:10.1111/all.12197. PMID 23991682. ^ Voehringer D (December 2009). "The role of basophils in helminth infection". Trends Parasitol. 25 (12): 551–6. doi:10.1016/j.pt.2009.09.004. PMID 19782643. ^ Nakanishi, Kenji (December 2010). "Basophils as APC in Th2 response in allergic inflammation and parasite infection". Current Opinion in Immunology. 22 (6): 814–820. doi:10.1016/j.coi.2010.10.018. PMID 21095110. ^ Shiratori, Ikuo; Yamaguchi, Masao; Suzukawa, Maho; Yamamoto, Kazuhiko; Lanier, Lewis L.; Saito, Takashi; Arase, Hisashi (1 October 2005). "Down-Regulation of Basophil Function by Human CD200 and Human Herpesvirus-8 CD200". The Journal of Immunology. 175 (7): 4441–4449. doi:10.4049/jimmunol.175.7.4441. PMID 16177086. ^ Janeway CA Jr.; et al. (2001). Immunobiology (electronic full text via NCBI Bookshelf) (5th ed.). Garland Publishing. ISBN 978-0-8153-3642-6. Archived from the original on 2009-06-28. ^ Böhm I, Speck U, Schild HH (April 2011). "Pilot study on basophil activation induced by contrast medium". Fundam Clin Pharmacol. 25 (2): 267–76. doi:10.1111/j.1472-8206.2010.00826.x. PMID 20412314. ^ Schroeder JT (2009). Basophils beyond effector cells of allergic inflammation. Adv Immunol. Advances in Immunology. 101. pp. 123–161. doi:10.1016/S0065-2776(08)01004-3. ISBN 9780123747938. PMID 19231594. ^ a b Heneberg, Petr (2011). "Mast cells and basophils: trojan horses of conventional lin- stem/progenitor cell isolates". Current Pharmaceutical Design. 17 (34): 3753–3771. doi:10.2174/138161211798357881. PMID 22103846. Wikimedia Commons has media related to basophils. This page was last edited on 15 March 2019, at 09:32 (UTC).